Because of their historical significance, the events of September 11th appear to exist in a timeframe of deferred comprehension. It is as if what is required – a god-like point of view – is distinctly unavailable. In light of September 11th, the work of Aernout Mik seems unnervingly relevant. It is hard to imagine artworks that could better encapsulate the historical moment. Constructing a hybrid form of video-installation/sculpture, Mik’s works offer a proto-realist immersion in events that are profoundly ungodly in their perspective. In ‘Reversal Room’ (2001) the artist creates a vaguely plausible Chinese restaurant scenario that one would hope never to be a part of. 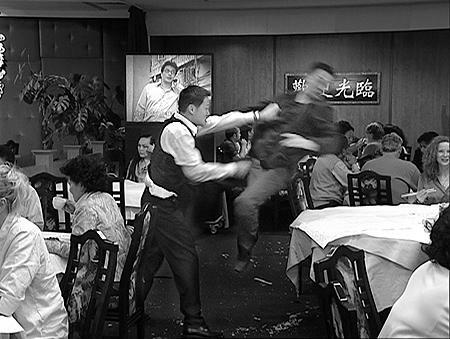 Portrayed from multiple perspectives, on 5 different screens, a scene of diners eating unravels into inexplicable – if low-grade – violence. Patrons appear little disturbed as three men shove one another, a table is overturned, and then righted again. The video-loop format ensures that this scene is repeated ad infinitum. Through the multiple perspectives represented, Mik violates the convention of representation that allows the viewer to master what they see by placing them at the apex of a singular perspective. The other diners’ implacability contributes to the feeling of unease, a confusion confounded by the work’s sculptural components. Viewers’ enter the piece via a path composed of low-level walls of height equal to the video projections, which are installed on the floor. To emphasize that the space of each video is equal to the space of the viewer, two glass-enclosed rooms abut the projections, one containing a chair, the other a door that goes nowhere. By creating a tension between the sculptural flow of the installation – which surrounds the viewer – and the stasis the videos’ portray, the artist replicates in abstract form the envelope of an incomprehensible reality. A lack of dialogue or even ambient noise further distances the viewer from the expectation of understanding. The overall effect is that of a curiously mesmerizing kind of estrangement. The work is convincing to the extent that one feels a part of the action. You are, in effect, inside the scene – in a restaurant – and can accept your place within it in the same way that you accept what you don’t know about the lives of the people who surround you. The work absorbs your attention within the problem of what you cannot understand, until you hit a limit of interest and switch back to feelings of indifference. Few works of art so accurately mirror the degree and limits of viewer engagement, a fact that curiously contributes to the work’s credibility. One explanation for this is found in the process the artist uses to create each piece. In a talk he gave at the Power Plant, Mik discussed how his working method strives to create the semblance of the real within the parameters of artifice. Each scene begins when non-actors are given minimal direction within ambiguous scenarios. Real dynamics develop out of play aggression as the individuals become absorbed by the actions they are asked to repeat and the situation takes on a life of its own, regardless of the absurdity of its premise – Mik reports that the scenes tend to fall apart of their own accord after about 50 minutes. Mik works within the conventions of cinematic realism because it has the capacity to create a reality adjacent to that of the viewer. Within those conventions, he contrives to torment the cinematic moment; in the scenes portrayed, things occur and yet fail to progress. As the 20th century techniques of collage and montage have demonstrated, viewers are more than able to assimilate discontinuous and disjunctive elements to a greater meaning, synthesized within the picture plane or filmic space. Mik’s innovation is to situate elements that are irreconcilable to one another within the scene itself. Periodically, ‘Reversal Room’, itself reverses, changing into a scene of people working in the kitchen of a restaurant, the videos now slowly rotating in a counter-clockwise direction. The situation would be unremarkable but for the presence within it of other people, drinking coffee or sleeping on available shelf space. While most just hang around, some of them follow behind the staff as they work in a somewhat disruptive matter. Their actions as useless as the employees are purposeful; those working take no notice of these literal parasites. Hence what we see seems fragmented against itself, as if two realities were on view, joined together but opposite, reconcilable only in a world beyond sense. Mik’s artworks succeed because he creates situations that are undecidable rather than implausible. Plausibility in fact helps the installations overcome the need for explanation as meaning moves from the particular to the general; the present lived as an abstract reality divorced from any awareness of its larger significance. This text originally appeared in BorderCrossings Volume 21#1 (#81). You are currently browsing entries tagged with Dutch artists at Army of YouTube.